Here is another intriguing #test for the sharp minded. Check out the reading card below, and see if you can spot the illusion immediately. Actually, it’s a very simple test, so no hints will be provided. When you’re finished, and think you have the answer – check the solution, and see if you were right! BTW, I am glad you liked our previous “Single Photo Illusion“, I think it was magnificent as well! How many times have you looked at a picture or image and thought something was wrong with it but you just couldn’t figure out what it was? Do you sit there and ponder the picture trying to determine where you went wrong and what needs to be done to make the picture correct? It has been said that your mind can play tricks on you, but many people don’t realize just how powerful the mind can be. You can look at something one time and never notice a problem because your mind can correct the problem as it looks at the image or reads the passage. For many individuals, they don’t even think there was a problem with what they read in the first place. Others might notice the issue quickly without having to think twice about it. A simple sentence with misspelled words or words out of place can quickly be corrected in your brain before you ever realize there is a problem with it. For example, what if you saw the following sentence: Do ewe sea the problum with the pitcher? Even though your brain might read the sentence as “Do you see the problem with the picture?”, the sentence on the paper is loaded with spelling errors and improper word usage that far extend what your brain is telling you. To understand the manner in which you can keep your mind sharp and hone in on your skills, take a look at this test and see how much of a genius you really are. See if you are able to spot the illusion immediately or if it takes you a second glance to find it. Since the test is relatively simple, you won’t be given any hints to help you out this time around. Were you able to figure it out on the first time through? Did you have to take a second glance to make sure you got it right? When you take the time to look for problems with an image, it tends to be easier to spot where the problem lies. Not knowing there is an issue with an image or piece of text can cause you to miss something that is right in front of you all along. 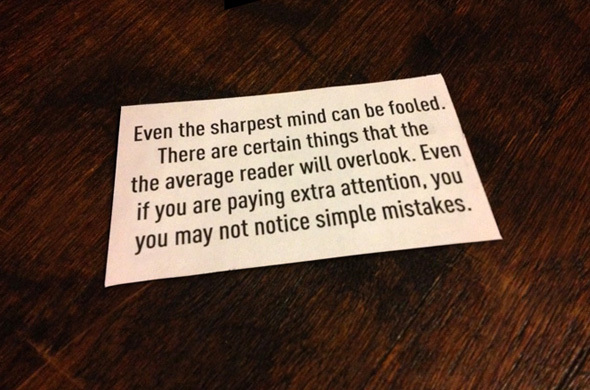 Testing your mind on a regular basis allows you to remain sharp minded and able to identify errors quickly and easily. When double words are thrown into a piece of text, people will often skip over the second word without ever realizing it was there. The brain automatically triggers a response in the individual to read the text in the manner in which it was supposed to be written. Instead of browsing for errors and spotting everything that was wrong with the piece, the brain goes into auto-correct and fixes any problems with ease. Training your brain to alert you to these errors can keep you on top of your game and catch any mistakes with your own writing before they become worse than they need to be. Well, it was pretty easy considering the repeated parts were in a different color than the rest of the paragraph. it’s not difficult at all when the “illusion” is highlighted. Am I correct to assume that the words in red are meant to serve as a distraction for what is actually wrong with the sentence that I’m not seeing? The doubled words colored red made it really easy to spot…. I think you accidentally showed us the solution (with the red words) first. Not the same “illusion” again..!? The words look all the same colour to me – black. It’s stll pretty easy to spot though. I thought that’s what it would be before I read it! One tip my old boss gave me when proofing text in artwork is read the text backwards. That way your brain does not “autocorrect” spelling or contextual errors. The repeated words in in the text above, become obvious if you do that. No, the red words were the answers. it says the two times! This took a long time but a good hint from me too you is read each word VERY slowly….